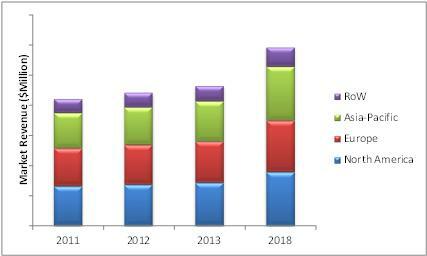 The food texture market is expected to reach $11,840.8 million by 2018, with a CAGR of 5.0% from 2013 to 2018. Texturizing agents are mainly used for improving the texture of the food by providing it with creaminess, clarity, thickness, viscosity, and various other characteristics. Although many customers are aware of the importance of flavor in the food product, many of them are unaware of the importance of texture in it. Various texturizing ingredients available in food texture market add various characteristics to the food. They are used alone or in a blend, in order to provide texture to the ultimate product. They are helpful in providing stable structure to the food, thus increasing its shelf life. The research report provides a comprehensive analysis of the texturizing agents market, which is witnessing steady growth on grounds of diverse applications in bakery and confectionaries, and meat & poultry products. Texturizers such as thickening, gelling, emulsifying, stabilizing, binding, and clarifying agents have been identified in the report. The advent of many such versatile functions has escalated their usage in application-specific ingredients and new upscale end-use products. The texturizing agents market was examined in terms of value, on region-wise and country-wise levels. The changing trends in the consumption of texturizing agents reflect the increased product penetration and purchasing power of the global population in the emerging economies. This report describes the food texture market across the globe. The regions covered include North America (U.S., Canada, Mexico), Europe (U.K., Germany, France, Italy, The Netherlands, Russia, etc. ), Asia-Pacific (China, Japan, Australia, India), and Rest of the World (Brazil, South Africa, Argentina). The main growth strategies of market players have been identified and analyzed. The manufacturers are keenly aware of the emerging Asian, Latin American, and Eastern European markets as potential drivers of the texturizing agents business. The market is predicted to continue flourishing in both, developed and developing regions. The growth is also attributed to growing demands for healthy and nutritious products, and increase in demand for processed food. U.S. is one of the largest players in the texturizing agents business due to excessive demand for processed food products, followed by Western Europe and China. CP Kelco (U.S.), Tate and Lyle PLC (U.K.) and Ingredion Inc (U.S.) are key manufacturers of food texturizing agents, globally. CP Kelco is engaged in the manufacture of texturizing agents such as hydrocolloids and whey proteins. Tate and Lyle PLC produces food stabilizers, emulsifiers, hydrocolloids, food starches, dietary fibers, etc. Ingredion Inc is involved in production of starches, emulsifiers and some other texturants. All the above-mentioned companies conquer more than 33% of the market share. CP Kelco has focused on the expansion as a main strategy, through facility expansion in different areas. The overall competitive environment for food texture market can be stated as partially consolidated with CP Kelco, Tate and Lyle PLC, and Ingredion Inc dominating the market share. Other companies such as DuPont (U.S.), and Kerry Group (Ireland) also contributed prominent share in food texture market. Texturizing agents form an important part of the food additives industry. They are mainly responsible for increasing the creaminess, improve viscosity, pulpiness, and ultimately texture of the product. 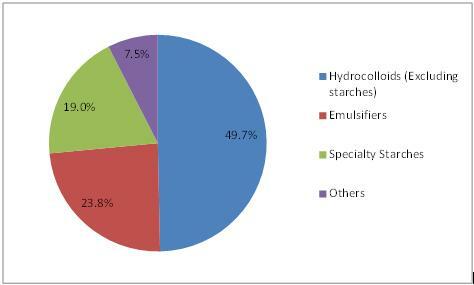 Hydrocolloids hold major share of 50% of the total food texture market. Emulsifiers hold almost 24% of the total market followed by specialty starches with 19% share. Other texturizing agents such as enzymes, dietary fibers, and some fat replacers are also used as texturizing agents up to some extent. The global food texture market has grown considerably in the last few years and this is expected to continue. Factors such as growing consumer preferences towards consuming low-fat foods, good textured food, increasing innovations in the food processing industry, and cost advantages provided by the substitutes contribute to the demands and adoption rate for texturizing agents as one of the major food additives. Though the food texture market is largely driven by hydrocolloids, emulsifiers, starches, stabilizers as well as other natural polysaccharides are expected to gain momentum in the near future. Bakery and confectionary items have been dominant in case of application sector scope. However, researches in various fields have opened up new avenues for the application of these substitutes. Meat and poultry, dairy and other convenience food products and beverages are also growing. North America forms the largest segment of the food texture market in 2012. It is poised to grow at a steady CAGR of 4.5% over the forecast period. Due to the increase in innovations in food solutions, demand for ingredients providing textures to food has been increased. Europe stands to be the second largest market due to increase in demand for processed food. Asia-Pacific is projected to gain the fastest growth of 6.2% during the concerned period. In the APAC region, food and beverage products with texturizing agents are making foray in a big way with the growing food processing industry. Texturants though primarily function as texturing agents, provide multiple benefits in food processing and improve appeal of food and palatability. Also, increasing demand for processed foods in bakery, confectionery, convenience foods, and dairy industries would drive the food texture market globally. 9.2 Archer Daniels Midland Co.